The table below lists the first group of 12 RAAF Wireless Operators, all Flight Sergeants, who were Posted TO 462 Squadron, Foulsham in January 1945, to dispense WINDOW. They were not permanently assigned to any one crew. 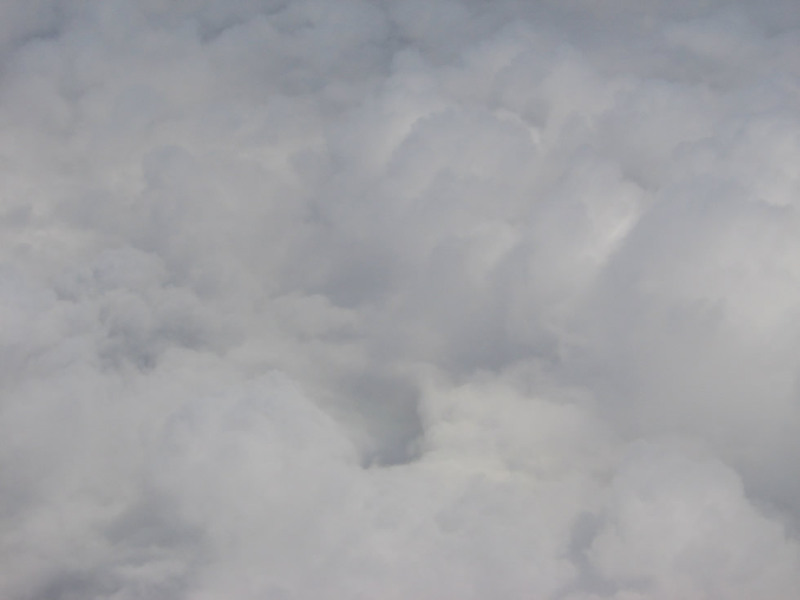 However some flew regularly with a particular crew (e.g. Stewart Edmund Taylor 433176 RAAF, 18 Ops with the Sharp crew). Others mostly flew with different crews on each Op (e.g. Fink, Irminger and Kimber). Stew Taylor also carried out the highest number of WINDOW Ops at 25, with Kimber and Tisdell both with 21 Ops. All of this group (excluding Tisdell KIA, and Hutton, PoW) were Warrant Officers when Posted FROM the Squadron in September 1945. The Ops recorded below were extracted from the 462 Squadron Operational Record Book, January to May 1945. "19/20 Ops" means 20 Ops recorded in ORB, less one early return not counted in final tally. "18 or 19 Ops" means that person is on record for the lower number of Ops, but may have had the higher number of Ops. However due to variations and errors in names and/or initials, the number of Ops cannot be accurately determined (e.g. six aircrew with surname Taylor in 462 Squadron in early 1945, some of whom carried out Window Ops in addition to their usual role). Aircraft that for various reasons failed to take off, were sometimes (but not always) listed by aircraft serial number and Pilot's name, but not with crew names. Therefore the names of Special Duties men scheduled for those flights are not known. Extra Op information may be found on the various crew pages, listed by Pilot and Crew number. Names with asterisk ( * ) are in the following photos of a group of Special Duties (WINDOW) Airmen and other personnel on VE morning. These two photos are also shown on the 462 Squadron page, with additional information there about the "non-WINDOW" airmen. The following table lists the second group of 12 RAAF Wireless Operators, who were also SD WINDOW Dispensers from 17 April to 2 May 1945. They were Posted TO 462 Squadron Foulsham in early April 1945.(e.g. Danson, MacNish and Willis-Jones on 10 April 1945, so probably all on the same date). Danson was Posted FROM 462 Squadron in August 1945, and the other eleven in September 1945 (e.g. MacNish and Willis-Jones on 18 September 1945, so probably all on the same date). All were Flight Sergeants except for Warrant Officer MacNish. They were not assigned to a permanent crew. Other Airmen also carried out multiple Ops as Special Duties, WINDOW, e.g. Alexander Gordon TAYLOR, 423491 RAAF, who was initially a WOP/AG, later WOP, with several crews; but carried out 16 of his 25 Ops as WINDOW Dispenser with various crews. There is no record of his POSTING TO 462 Squadron in the ORB, but his Ops were recorded from 4 November 1944 to 2 May 1945. Individual members of various crews also occasionally carried out WINDOW duties to "catch-up" on Ops. Included below are enlistment and/or later photos from relevant RAAF Service Files from the National Archives of Australia (NAA), if they had been digitised by 31 July 2017. More will be added if they become available. Footprints on the Sands of Time – RAF Bomber Command Prisoners of War in Germany 1939-45. Oliver Clutton-Brock 2003; or from sources as noted in the text. Photo from the Neville Owen Reed Collection. VE Day 1945. Names for Special Duties (WINDOW) in bold font. Standing: Greg Farrell, Ron Gibson. Middle Row: Bill Caddy, Jack Wall, Mick Toohey, Ron Irminger, Vic Chaffer, Frank Andrew, Grant Boys, Lionel Dittmann, Ernie Stanton. Front: Stan Tills, Nev Reed. Photo from the Aviation Heritage Museum of Western Australia. "462 Squadron, RAAF, Foulsham, May, 1945. 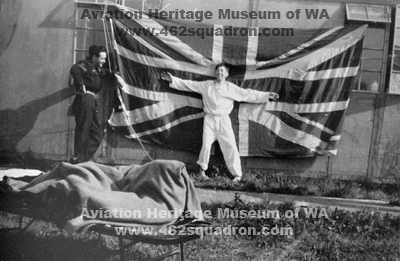 2 Airmen against background of The Union Jack, VE morning". Left, in uniform: Stan Tills (previous photo, front row, left). Right, in pyjamas: Vic Chaffer, over-vest removed (in the group photo at left, he is 5th from left in centre row, wearing dark vest over pyjama shirt, i.e. behind Reed wearing boots in front row). 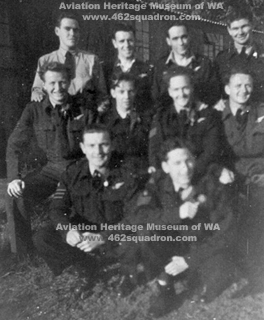 462 Squadron, RAAF, Foulsham, c.1945 – 10 Airmen "Special Operators". 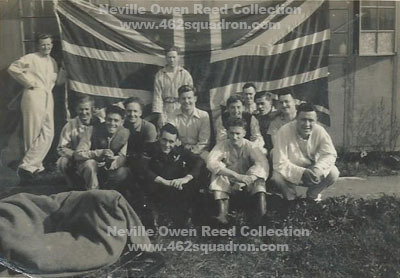 The airmen are not identified by name, however some faces are very similar to some of those in the VE Day photos above. The donor was Stan Tills, so it is likely that he is in the group photo. 3. Tills (or Taylor ?) 4. not identified. 3. Mick Toohey (? ); 4. Moore (?). Front, left to right: 1. Unknown; 2. Vic Chaffer (?). They are the remaining ten from the first group of 12 WINDOW dispensers – Hutton was PoW on/after 08 March 1945, and Tisdell was KIA on 17 April 1945. If you can assist with identification, please make contact. Group 1 – Posted TO 462 Squadron in January 1945. Vic Chaffer is included in the VE Day photos above. 19/20 Ops (1 early return) from 01 February to 23 April 1945. 1 Op with each of Frazer Crew 56, Fleming Crew 60, Smith Crew 51, Sullivan Crew 61, Britt Crew 47, Paull Crew 53. 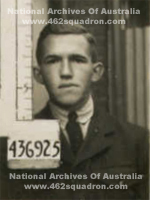 Gregory Patrick Farrell, 432776, RAAF; at enlistment, 2 Recruiting Centre, 29 January 1943; single, aged 18, ex ATC Cadets. 17 September 1945 – Posted TO 9 ACHU, Gamston. 1 Op each with Marchant Crew 32 and Ferguson Crew 66. 17/18 Ops (1 early return) from 07 February to 23 April 1945. Hines Crew 65; Fuller Crew 68; Gallop Crew 67; Grant Crew 62. The Australian Nominal Roll records PoW status as "No". 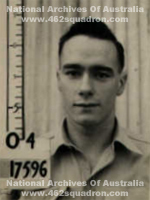 However Hutton became a PoW in his role of SD (WINDOW) as a member of the James crew, who failed to return from an Op to Dortmund on the night of 08 March 1945. He is listed in Clutton-Brock's PoW book as RWC HUTTON, on page 325. All eight members of James' crew are listed as PoWs by Clutton-Brock. 11 Ops (Missing from Op 11) from 01 February to 08 March 1945.
and James Crew 24 (Missing on this Op). 17 Ops from 01 February to 23 April 1945. Ball Crew 59 (attacked by FW190, damage claim by R/AG Hibberd). 21 Ops from 02 February to 22 April 1945. McGindle Crew 19; Sharp Crew 41; Tootal Crew 57; Scharer Crew 54; Sullivan Crew 61, Taylor Crew 12. 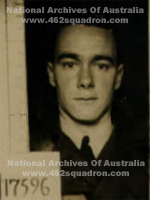 Maurice Kevin Moore, 432059, RAAF. single, aged 21; previous service with 31st Batt'y., 108th Anti Tank Reg't. Above right: 14 March 1943, at 2 ITS, Bradfield Park. 20 September 1945 – Posted TO 9 ACHU, Gamston. 15 Ops, 86 hours 20 m Operational flying, from 01 February to 02 May 1945. Britt Crew 47; Bailey Crew 46. Photo from the George Sinton Bland Collection. Stewart Edmund Taylor, 433176, RAAF; cropped from the formal photo of Sharp Crew 41 photo, taken in Norwich; date determined as late May 1945, so Stew was not yet 21. Stew carried out 25 (or 26) Ops as from 01 February to 23 April 1945. Stanley Ernest Tills, 17596, RAAF; undated, marked as 4RC, so probably at enlistment, 4 Recruiting Centre, 28 August 1940; single, aged 20. He commenced training as Pilot, but was later re-mustered and trained as Wireless Operator / Ar Gunner. Tills may be in the Smith Crew 51 photo beside Halifax MZ341 Z5-P.
Stan carried out 18/19 Ops (1 early return), 110 hours 25 m Operational flying, from 01 February to 14 April 1945. 1 Op with each of Jackson Crew 14, Uther Crew 26, Marchant Crew 32, Ely Crew 39, Boyd Crew 40, Anderson Crew 45, Britt Crew 47, Swann Crew 55, Ball Crew 59, Fleming Crew 60, Hines Crew 65. Stanley Ernest Tills, 17596, RAAF; undated, storage envelope marked as SD, so probably at 4 SD, West Perth, on/about 19 January 1942. 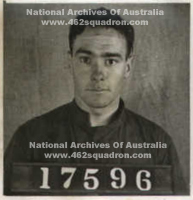 Errol Dallas Tisdell, 432388, RAAF. Above right – 14 March 1943, at 2 ITS, Bradfield Park, Sydney. 15 January 1945 – Posted TO 462 Squadron, from 11 PDRC. 17 April 1945 – Killed in Action with Lodder Crew 44, who failed to return from an Op to Augsburg, on the night of 16/17 April. More details are on that crew's page, as well as a photo of the Headstone on his grave in Durnbach War Cemetery, Bayern, Germany. 21/22 Ops (1 early return), from 01 February to 17 April 1945. 3 Ops with Lodder Crew 44, KIA. Michael Patrick Toohey, 429056, RAAF, at enlistment, 2 Recruiting Centre, 22 October 1942; single, aged 19, and still in Army uniform. Previous Military Service from December 1941 to October 1942, at 103 Convalescent Depot, Army Home Defence Forces. 20 (or 21) Ops, Operational flying 116 hours, from 02 February to 16 April 1945. 1 Op with each of Taylor Crew 12 and Lodder Crew 44. 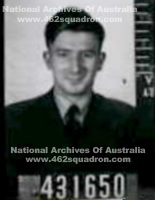 Michael Patrick Toohey, 429056, RAAF, on 18 February 1943; during posting to RAAF HQ, at Bradfield Park. Michael Patrick Toohey, 429056, RAAF, at 2 ITS, Bradfield Park, on 14 March 1943. John Wall (Jack) is included in the VE Day group photo above. 1 Op with each of Smith Crew 51; Boyd Crew 40; Whatling Crew 42; Grant Crew 62; Anderson Crew 45; Fuller Crew 68; Hines Crew 65. 2 Ops with Grant Crew 62; 1 Op with Sherren Crew 50. 2 Ops with Scott Crew 64. 23 August 1945 – Posted TO 11 PDRC for repatriation to Australia. 2 Ops, 12 hours Operational flying, from 17 April to23 April 1945. 1 Op, on 02 May 1945, with Ferguson Crew 66. 3 Ops, from 22 April to 02 May 1945. 1 Op with each of Gallop Crew 67, Hines Crew 65, Fleming Crew 60. 2 Ops, from 17 April to 22 April 1945. 1 Op, on 02 May 1945, with Smith Crew 51. 2 Ops, from 19 April to 24 April 1945. 1 Op with each of Scharer Crew 54 and Robinson Crew 63. 18 September 1945 – Posted TO 9 ACHU, Gamston. 3 Ops, 15 hours 10 m Operational flying, from 19 to 24 April 1945. 1 Op with each of Ferguson Crew 66, Hines Crew 65, Bailey Crew 46. 2 Ops, from 19 April to 23 April 1945. 1 Op with each of Cairns Crew 69 and Langworthy Crew 34. 1 Op with each of Fuller Crew 68 and Sullivan Crew 61. 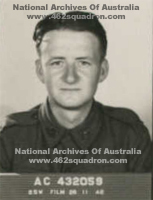 Henry Richard Willis-Jones, 431650, RAAF; undated but probably at enlistment, 1 Recruiting Centre, 16 July 1943, single, aged 24; previous service in 6th Batt'n, Royal Melbourne Regiment. 2 Ops, 15 hours 05 m Operational flying, from 18 to 22 April 1945. 1 Op with each of Gallop Crew 67, and Sullivan Crew 61.